Love Means … No Boundaries is Andrew Grey’s third book in the Love Means spin-off series and the sequel to Love Means … No Shame. I found this book to be the author’s most romantic and touching story in the series to date with two endearing characters that you cannot help but fall in love with. Joey Sutherland is first introduced to us as a secondary character in Love Means … No Shame when, as a sixteen year-old from a poor family, he is taken in by Len Parker and his son Geoff Laughton and given a part-time job as a farm hand in exchange for riding lessons, and who both Len and Geoff discretely look after. Love Means … No Boundaries takes place a number of years later. Joey has graduated from college and is living with Geoff and his life partner Eli working as a crop manager on the Laughton Farms. He has also suffered a motorcycle accident that has left his face severely scarred and Joey extremely self-conscious and insecure. So much so that he is reticent of leaving the farm let alone interacting with others, except with Geoff and Eli. Robert “Robbie” Edward Jameson is a talented violinist with the Youth Symphony Orchestra and he is also blind. Coming from an affluent southern family Robbie does not want for anything, except perhaps the freedom and support to live his life to the fullest. Although his family is a loving one, their over-protectiveness is smothering Robbie and isolating him from the world. Robbie comes to stay with Geoff and Eli over the summer to play with the Youth Orchestra where he flourishes and he and Joey very quickly become close. The story is told from the perspectives of both Joey and Robbie and the author alternates the points of view of both characters as each struggles with his personal fears and insecurities. Their disabilities and life circumstances may be different but both Joey and Robbie have similar obstacles to overcome, their belief that they will never find someone with whom to share their life. As with the other books in this series, the author takes his time in developing the relationship between the two protagonists laying first the emotional foundation upon which to build. Joey and Robbie are friends, first and foremost, before they become lovers. Joey instinctively understands Robbie’s need to feel useful and to do things for himself and encourages his curiosity and independence in trying out new things in life. Robbie in turn intuitively senses that Joey is in emotional pain and when he comes to learn of its source sets out to convince Joey that he is beautiful despite his scars. In this sense they draw strength and learn from one another and in the process help to breakdown the boundaries that have been imposed upon them, both from within and without. Mr. Grey revisits the themes of true family and belonging in this story through what I consider his trademark in respect of this series – his well-written and fluid narration and equally well-developed characters. Love Means … No Boundaries is very much a character-driven story and there is a tenderness with which the author writes Joey and Robbie, their coming together and how they treat each other that I found most touching. I was so completely immersed in Joey and Robbie’s story that I initially read the book in one sitting, and enjoyed it so much that I read it again. Love Means … No Boundaries is a tender and sweet love story that embodies all the elements of a good romance and excellent storytelling the combination of which provide for a rich reading experience. For those who have read the previous books in this series you won’t want to miss this one. For those who have yet to read this series, while Love Means … No Boundaries can be read as a stand-alone book I suggest reading the first book in the series Love Means…No Shame and it’s prequel Love Means…Courage before embarking on this one, in order to more fully appreciate the heart-warming people and family that Mr. Grey has created in this book and in the series as a whole. 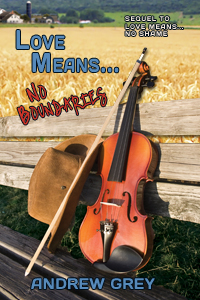 Love Means … No Boundaries by Andrew Grey is available at Dreamspinner Press. This entry was posted in Fiction, Indie Reviews, LGBTQ, Rainbow Reviews, Romance and tagged Andrew Grey, Dreamspinner Press by Indie Reviews. Bookmark the permalink.